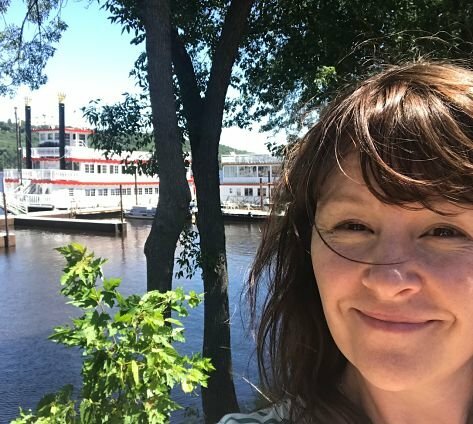 Join us on the river! 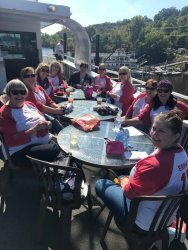 Our 3rd year of Knit the River cruises! 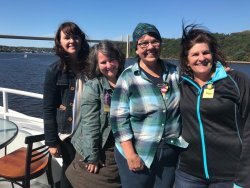 We are chartering a couple of boats on the beautiful St. Croix and we hope you'll join us for a fun, casual afternoon or evening with other fiber junkies. Bring your knitting or crochet project or your spinning wheel and join us on the river! The boat leaves at 5pm promptly. The boat leaves at noon promptly. Trust us, the boats leave promptly! Come early! Meal includes; deli sliced ham, turkey breast, roast beef, salami, pepperoni and deli cheeses served with fresh bakery rolls and sandwich fixings. Accompanied by pasta salad, potato salad, seasonal fresh fruit and cookies! 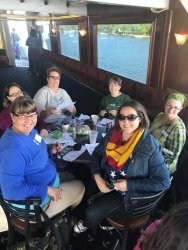 The $45 ticket price includes the 2.5 hour river cruise, meal, lots of door prize drawings, and new this year, a Knit The River Keepsake! You'll have endless conversations with folks that are just as passionate about fiber as you are. It's priceless when you think about it! You will not need a paper ticket for this event. We will add your name to our guest list and check your name off as you arrive at the boat! You will get an email confirmation when you check out online. We will send you an email as we get closer to the event with more details on the day. The boat dock is directly to the south of our building. Just a few steps from our side door. If you are coming from the cities on Hwy 36, or from Hwy 94, you will be coming north on Hwy 95 (main street). As you get into town, just before you get to our building, on the river side of the road, you will see a metal building with the name St. Croix Boat and Packet. Turn right just past the building. Follow the St. Croix Boat & Packet parking signs to free parking, or park for $5 all day in the parking lot. The boat sails rain or shine so no refunds will be given for inclement weather, there is plenty of indoor seating on the boat. No coupons or discounts apply to this item.